. RSS readers allow you to subscribe to a feed and everytime there's an update, you can simply read it on your feed. As for the mindset behind this move, again that's anyone's guess, but from an outsider looking in, I don't see the benefit. This change happened a few days ago and what the Youtube feed allowed people to do was take "anyone's" Youtube account and add it to their reader which added a LOT of convenience to follow your favorite Youtuber's. Now don't get me wrong... you can still keep up with any user you want to on Youtube, but you'll have to do it manually from now on.. bummer right, until they come up with another solution for this change that has recently taken place. Consider this infographic which has some staggering numbers to consider. This is representative of how we are truly becoming an online world. The image is coined, "Data Never Sleeps" and who would argue that. Sharing this infographic with you should shed some light on your efforts to get noticed online. To think that we started out with email and it's morphed into many different avenues of sharing and connectivity. Interestingly enough, many of the same trends that we see in activities offline, we're seeing that trend online too. For those of us thinking about increasing our presence online, you can never get away from the mindset of "what's in it for me" as you're composing content for your visitors and readers. However, here are the roads of interest that you can't ignore. 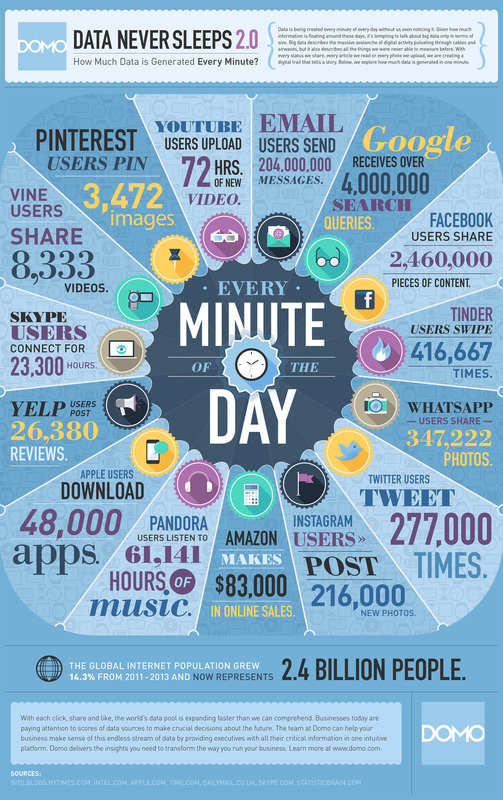 This data tells you how much data is being is being generated "every minute of every day" and where it's happening... THAT.. my friend.. is powerful data to consider and use in your quest to increase your visibility online. Without question, it's challenging to rank a website in Google. However, interestingly enough it can be much easier to rank a video in Youtube. The reason for this is that to rank in Google, there are 200 or more ranking factors that are taken into account, but in Youtube, the ranking factors aren't nearly that wild. There are factors that are taken into account that I'll share with you. The reality is that most people don't really care about SEO'ing their videos when they upload which will give you the advantage if you take a few minutes to do what the greater majority won't. A. Don't write a super short description. I can't tell you how many videos I've watched that tell you very little about what the video is about. If Google doesn't know much about your video then don't expect it to rank well. So the longer the description, the better. It doesn't need to be a book but 2-3 paragraphs isn't a bad idea. B. Choose Keywords that have video results whenever possible. You're trying to drive more traffic to your video and to increase it's rank. Look the keyword up in Google first to see if there are any video results on the first or second page. How to videos are great for this. If you search the keyword phrase, "how to straighten hair" you'll see video results. If you were to do a search for the keyword "hair" in Google, you'll get images, maybe news articles but no videos. So again, focus on keywords that have video results in Google too. C. The BIG BIG difference between Google and Youtube is the use of backlinks. Some will argue that backlinks aren't that important in getting ranked in Google, but that depends on your experience. I've had experiences where they helped and others where they didn't. Youtube does place much more weight on "user experience". So if you're encouraging people to subscribe to your videos through asking them at the end of your video or the start or linking them to a page where you can get them to subscribe to your channel, that will help your ranking and traffic too. More subscriptions to your video and channel signals Youtube this is a video that needs to move up in their SERP. The bottom line is that if you invest a little more time into your video SEO, you're going to see much more traffic and success in your video ranking that most people ever do on Youtube.